The flight took place with ‘no particular problems,’ according to Japanese defense officials. Mitsubishi Heavy Industries’ experimental fifth-generation fighter technology demonstrator X-2 “Shinshin” (formerly the ATD-X) for the first time took to the skies last Friday morning, The Japan Times reports. After the United States, China, and Russia, Japan became the fourth nation to test-fly an indigenously-developed stealth aircraft. The X-2 painted in red and white colors took off from Mitsubishi testing center located at Nagoya aiport in Aichi Prefecture at 8:47am local time on Friday morning and flew for about 50 kilometers (31 miles) to Gifu Air Field, an airbase of the Japan Air Self-Defense Force, situated in the neighboring prefecture of Gifu, where it landed at 9:13am (See videos here and here). A consortium of 220 Japanese firms, with Mitsubishi Heavy Industries as the primary contractor developing the aircraft’s fuselage, has been working on the X-2 project for the past ten years. “The reason behind the development of the F-3 is the refusal of the United States to sell to Japan the Lockheed-Martin F-22 Raptor stealth air superiority fighter in the 2000s,” I explained previously. Lockheed-Martin purportedly has also been playing an undetermined role in the development of the X-2. Mitsubishi Heavy Industries is expected to deliver the aircraft to the Japan Air Self-Defense Force in June after the completion of a second test flight and additional ground tests. Japan will decide over the next two years whether it will develop an indigenously-designed fifth-generation air superiority fighter, the F-3, by 2027 out of the current X-2 prototype. Only one full-scale X-2 aircraft has been constructed so far. So far, Japan has spent around 39.4 billion yen ($332 million) on the development of the aircraft. 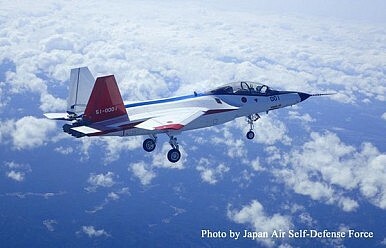 The principal objective of the [X-2] program is to develop a research prototype aircraft — an “advanced technology demonstration unit” — to test the capacity of Japan’s defense industry to develop, among other things, a powerful fighter engine and various other indigenous stealth fighter aircraft technologies. According to IHS Jane’s Defense Weekly, the aircraft has a length of 14.2 meters (46.5 feet) and a wingspan of 9 meters (30 feet). It is powered by two IHI XF5-1 low-bypass turbofans and has a maximum speed of Mach 2.25 (2,756 kilometers per hour) and a range of 2,900 kilometers (1,802 miles). Over the next few weeks, aviation experts ‘will continue analyzing data and check its stealth technology capability,” a Japanese defense official told AFP. Japan is slated to launch a tender for a new fighter aircraft this month.